Capt Jay’s History, I have been fishing my whole life. I caught my first fish with my father, at the young age of 20 months. That first 2lb flounder was just the beginning I am a fourth generation fisherman, and fishing rod builder. Although, I am the first in my family to take fishing from an avocation to their primary vocation. My great grandfather was a rod builder, and I still have a few of his hand made split bamboo rods. Every fishing rod on the boat was built by myself. My first paid fishing job was at the age of 13 as a second mate on the New Popeye, an 85 foot “party fishing boat”. Now at 40, I can honestly say that I have been fishing professionally for more than 27 years. I worked charter fishing boats throughout college in New Orleans. I then began grad school in Miami, first as a mate, then as a captain on charter boats. At that time I also spent a lot of time tournament fishing, both in the Gulf of Mexico (out of New Orleans) in the Bahamas, and out of Miami . My first charter boat was a 24foot Topaz “Sweet Gina”. It had a single diesel engine, tuna tower, and ran daily trips for up to 3 anglers. As an avid fisherman my most memorable job fishing came at the the age of 21. With a new 100ton U.S.C.G. captains license in my hand, I landed a job as captain of a 90 foot “party” fishing boat which ran three-day, and two-day long-range fishing trips, deep in the Bahamas. In charge of a five man crew, and up to 40 passengers, this job was a great learning experience. I stayed on that boat for seven seasons, and had the opportunity to catch just about very great fish available in the Gulf Stream. From a 9lb Yellow tail Snapper to a 90lb Black grouper, a 600+lbs Giant Blue Fin Tuna, to an 800+lbs Blue Marlin. 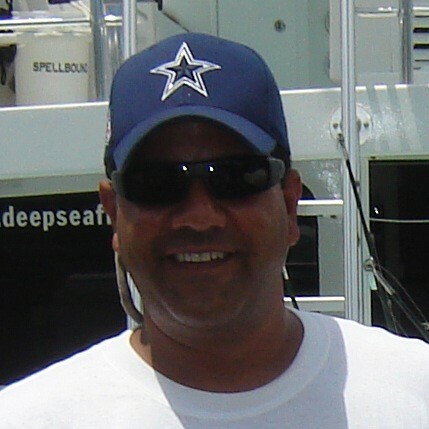 The Bahamian fishing season was only from the Spring to the Fall, so I spent most winters running charter fishing boats and commercial fishing in Miami. My second boat was a partnership in a 44 Striker named, ” A Quit All”. After running that boat for more than four years out of the Haulover Park Marina, I acquired sole ownership of my first full size charter fishing boat the “Spellbound”. Now, the most exiting chapter is about to be written… We spent more than two years first designing, then searching for just the right custom boat builder to build our all new completely custom designed Sports Fisherman. Our new boat was designed from nearly 30 years of experience to make the ultimate fishing machine while also making the most stable and comfortable platform for our customers. A year of design, another year finding the right builder, and a year to build the boat, our time has come and the ALL NEW Spellbound is here! Seven days hard running from Newton Boats in Slidell Louisiana and a lot of hard work and the 57′ brand new Spellbound is in service, USCG licensed & inspected for large groups. We are no longer limited to six passengers! So bring your friends and lets go fishing on the All New Newton Sports Fisherman hull #1 “SPELLBOUND”. My greatest accomplishments are some tournament wins like the first place fun fish boat in the Miami Billfish Tournament. Although possessing a few I.G.F.A. records, METT Tournament wins, and guiding customers to their own I.G.F.A. records, my favorite accomplishment was the discovery of a new species of Tile Fish. Experiencing the process of the research, and realization I had received the great honor of discovering an unknown fish. The icing on the cake was when I was given the privilege to name it (Bahama Tiger Tile). Another mile stone is my relationship with SIMRAD marine electronics. We have become one of their new equipment testing platforms and may have a small part in influencing how their equipment evolves. Having fished many tournaments, wining several, and placing in many, it is charter fishing that I truly enjoy. Being able to help anglers catch there first Sailfish, break their own personal records, I.G.F.A. records, or the best of all catching a child or adult their first fish. That’s the greatest part of professional fishing. But to me the most important part of charter fishingis to have fun !